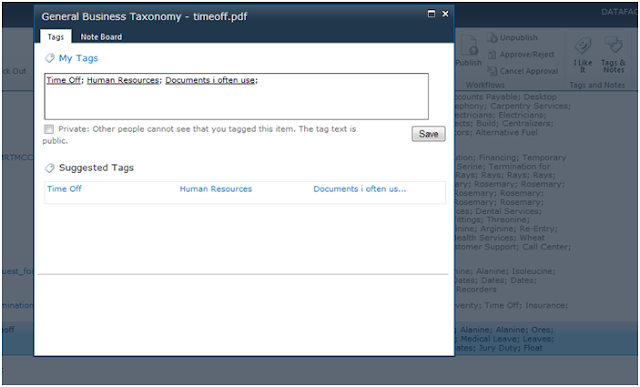 Previously in this blog, I've discussed the basic managed metadata capabilities in SharePoint 2010, that is, the ability to import taxonomies into the SharePoint 2010 Term Store and then tag documents with metadata from these taxonomies in a managed metadata column by browsing through the taxonomy hierarchy or using the type-ahead search feature. Once documents are tagged users can then browse through document libraries or filter through search results using the managed metadata tags. Managed metadata can be used in many other ways in SharePoint 2010 as well. Today, I wanted to discuss the way managed metadata and taxonomy can power social features and collaboration in SharePoint 2010. Term sets can be accessed from other areas besides managed metadata columns. First, let's look at the "Tags and Notes" button in the upper right hand corner of screens in SP2010. Here, I have selected a paid time off form that WAND uses internally and loaded into SharePoint 2010. I was able to add two tags that are from the General Business Taxonomy which I have loaded into the term store, but I was also able to add my own keyword "Documents I often use" which will go into Sharepoint as a metadata keyword and will also appear on my user profile. This shows how users can take advantage of a combination of managed term set tags as well as their own social or folksonomy tags. If I choose to make these tags public, then other users will be able to search by these as well and even apply the tag "Documents I often use" to documents that they want to tag. I can also make some reference notes about the document on the "Note Board" that others can see. Once I've tagged a document in "Tags and Notes", I can click on "My Tags" and it takes me to my profile where I, or other colleagues, can see all the documents that I have tagged with managed metadata or with metadata keywords. You can see that a tag cloud has been started to show the tags that I've used most often, in this case, Human Resources. This gives people a pretty quick view on the types of documents that I'm particularly interested in. There is an activity flow on the right that shows the types of documents I've tagged most recently. I can filter this activity flow using the tags that appear in my tag cloud. Once great feature of SP2010 is the ability to tag pages on the general web with managed metadata and managed keywords. Below, I've tagged an article on Yahoo! about a baseball game using managed metadata from the WAND News Taxonomy. You could imagine finding an interesting article about an important topic to your business and tagging it with a managed metadata term. This allows me to keep track of items that are important to me, but also to share and expose them with my colleagues. 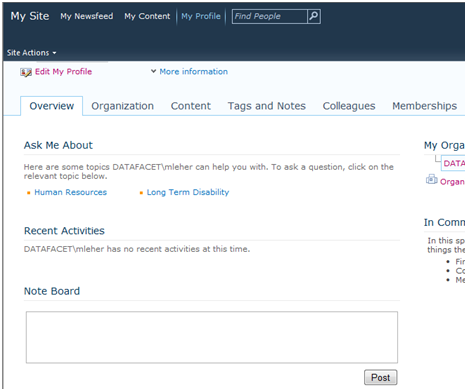 Now, by clicking on the overview tab, we see how my profile summary will look to the organization. You can immediately see that I have tagged myself as and expert in the managed metadata tags "Human Resources" and "Long Term Disability". This is a powerful feature that allows everybody in the organization to claim their areas of expertise and make themselves easily available as a resource for answering questions about that topic. Here, managed metadata truly drives collaboration by connecting the experts in an organization with the people who need their expertise. Finally, each individual managed metadata term has it's own profile page where users can see document that have been tagged to that term. 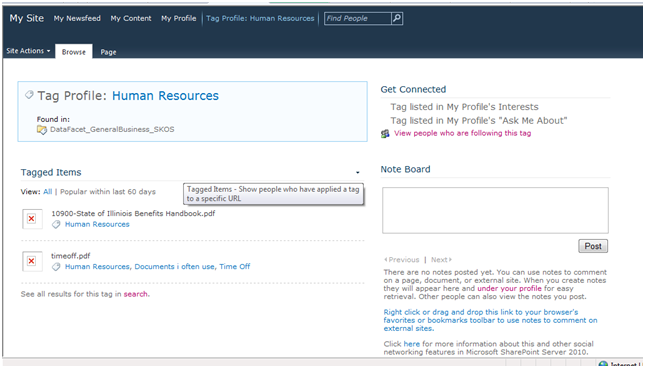 Users can list the tag in their own profile as an interest or list the tag as an area of expertise on their profile. A user could also see what other people may be following the same tag, providing another means to connect up with others in the organization. The collaboration and social features in SharePoint 2010 can be extremely valuable for sharing information and ideas inside of an organization. These features also further underscore the value of taxonomies and managed metadata. By deploying normalized managed metadata tags based on controlled taxonomies, you can ensure that people are using the same terms to assign tags based on product names, department, subject area, or other taxonomy areas. For example, without a managed term set, you may have one expert tagged to HR, one expert tagged to Human Resources, and one expert tagged to "Employee Issues". This would act as three different tags when there should only be one. Or, if one tag is LTD and another is Long Term Disability, then a user expressing interest in one of these tags would miss out on all the documents associated with the other version. 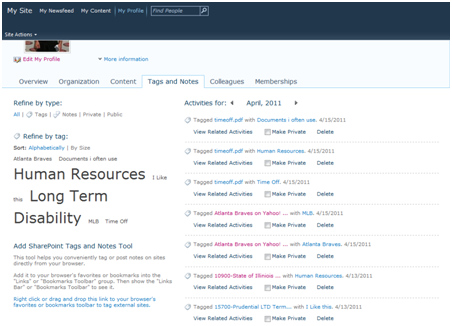 As always, WAND has a large library of pre-built taxonomies and professional services to help your organization get started with a managed metadata initiative in SharePoint 2010.